I know that you have probably been scouring the internet researching what you need to start a online coaching business. I also know you are probably super confused and overwhelmed with all the different information and all the how-to videos and posts and “OMG I am never going to be able to do this” is what you are thinking…..
It’s ok. I am here for you. I have been there and now I am here to make it easy. 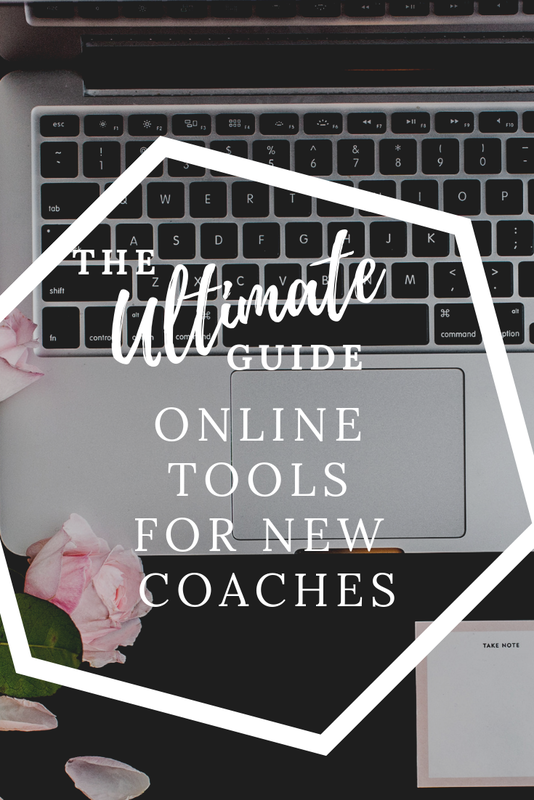 I have put together the Ultimate Guide of Online Tools for new coaches just for you! Website- This does not have to be a Wordpress site which is super complicated and expensive to set up. Regardless of what you have read (because I know what you have read <insert winky emoji>) you can absolutely use Squarespace or Wix for a simple easy to use site that has everything you need to set up your business and start attracting your dream clients. Branding- Just the basics so the clients you are attracting can start to recognize you when they see you. Another myth buster here- You don’t have to have or know how to use Photoshop or Illustrator for this either. No prior design experience required and you don’t have to spend a fortune on someone to do it for you! I use Canva- Its amazing and you can do most of what you need in the free version! Email Service Provider- You need a professional place to keep all of the contact info for the clients you will be attracting. Using an ESP allows you to communicate with your potential clients legally so they can get to know you. ESP is important for a lot of other things after you are established as well so it is crucial that you set is up in the very beginning. I use Mailerlite- Its free up to 1000 subscribers and offers lots of features that are easy to use and perfect for your new coaching business. Social Media- is extremely important for organic marketing aka finding your dream clients. Since most people don’t actually go looking for a life/relationship/insert your coaching title here, you have to find them and the easiest way to do that is through social media since most of the world communicates here. I personally love Instagram and Facebook. Search Engine Platform- The most common SEO platform is Pinterest. Pinterest is how I figured out what was going on with my soul. Pinterest is where your potential clients will find you and is amazing for driving traffic to your website. Payment Platform- All coaches deserve to be paid for the amazing life-changing transformations that they offer and you need a secure service to get paid. My favorites are PayPal, Stripe, and MoonClerk. Scheduling Platform- In the beginning it’s OK to just use your smartphone or paper planner to keep track but once you start building your amazing coaching business you will prefer something more automated. I use Setform. Online Video Call Platform- This is extremely important for your online coaching sessions especially if your goal is to be location independent. I use Zoom which you can use for free and there is paid version as well. Analytics- This is extremely important as you want to know where your people are coming from and how your marketing is working. This shows you where you should concentrate your marketing efforts once you get established. This is my favorite part. I love being able to see how my content performs and how my clients are finding me. Course Platform- If you plan to offer a group program which is the best way to make an impact on more of your dream clients at one time, it’s important to offer your program on a platform set up just for that. My favorite and only platform is Teachable! Teachable is easy to use for both the teacher and the students. It’s affordable and easy to customize. BONUS- A person to walk you through setting this all up! That’s Me! I am a Simple Tech Specialist and I am here to help you get your new coaching business up and running online and ready to attract your dream clients. My signature program Tech Ready in 30 Days- a group setting where we get all of this set up and ready to go! Click here to learn more about this program!